One of the best things about watchmaking is that when people realize it is something you do, they always have a watch that needs fixing. Usually it’s a non-working sentimental heirloom piece that has sat in a drawer for years. Unfortunately, the world of watch repair can be so opaque that many people are scared to approach it unless they know someone. It’s not hard to either get taken advantage of or to wind up with a bill that far outstrips the value of the piece. Furthermore, watchmakers usually can’t give a price until they have put in a significant amount of work, making it very hard to back out. All of these issues make people very comfortable with coming to me with a watch that needs fixing. 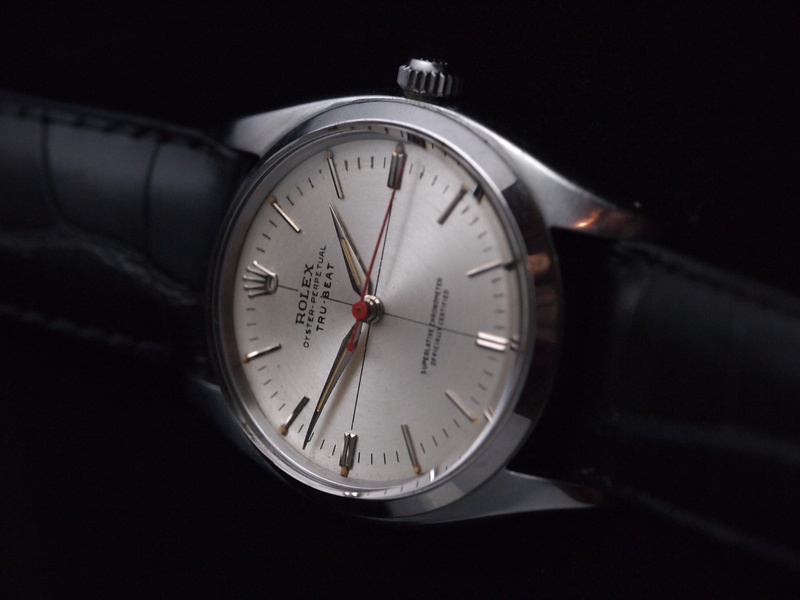 Most of the time it is a relatively simple watch, but occasionally it is an unbelievable rarity, and a privilege to work on. 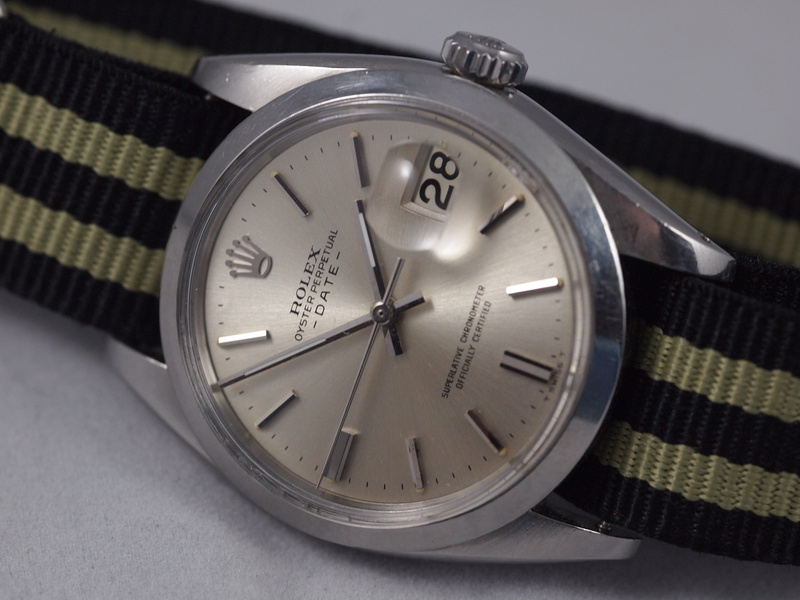 This Rolex Tru-Beat was certainly one of the most exceptional rarities I have yet had the pleasure to work on. I was handed this watch in non-running condition and although it needed a huge amount of work, it was worth every bit of it. 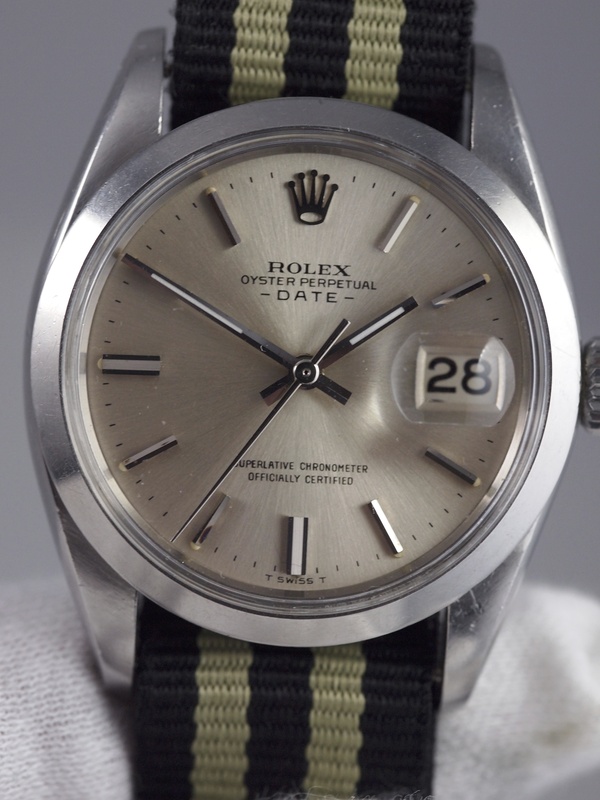 I am personally a bit wary of the Rolex collector market for several reasons. One of the major reasons being that what seems to determine the value of the pieces is not mechanical but purely aesthetic. 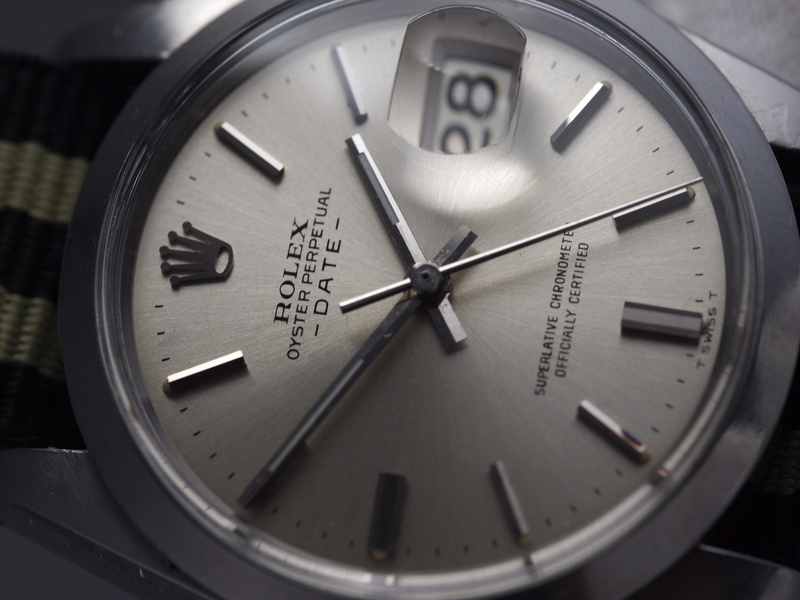 It’s all about the dial, or the bezel, or the crown. To me that’s all well and good, but I like interesting content not a $60,000 price tag for a bake-lite bezel. This fact in Rolex collecting also makes it much easier to fake things (change a dial and the price goes up 10x.) This makes it all the more important that you go to a trusted vintage dealer like Matthew Bain, etc. For evidence of just how big the sums can be, see the current lawsuit between John Mayer and vintage dealer Bob Maron. 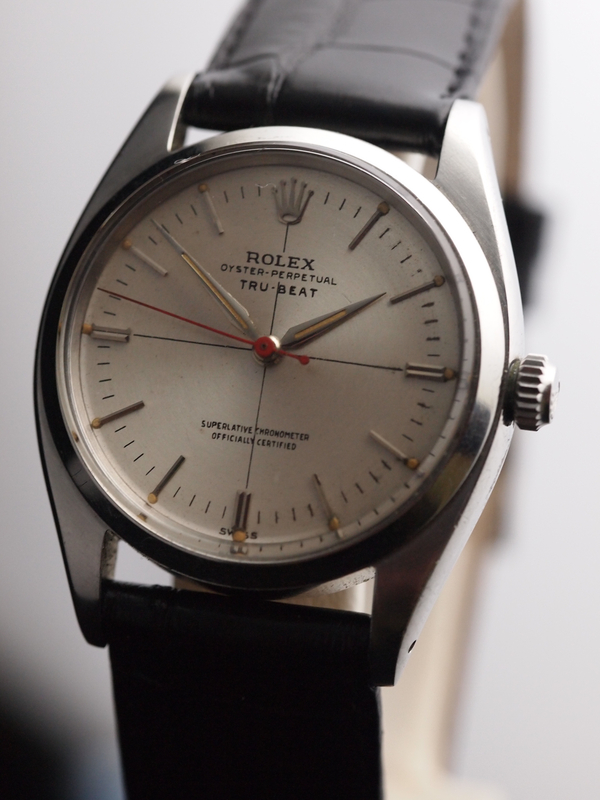 The Tru-Beat is a little different than typical Rolex, and that is what I love about it. 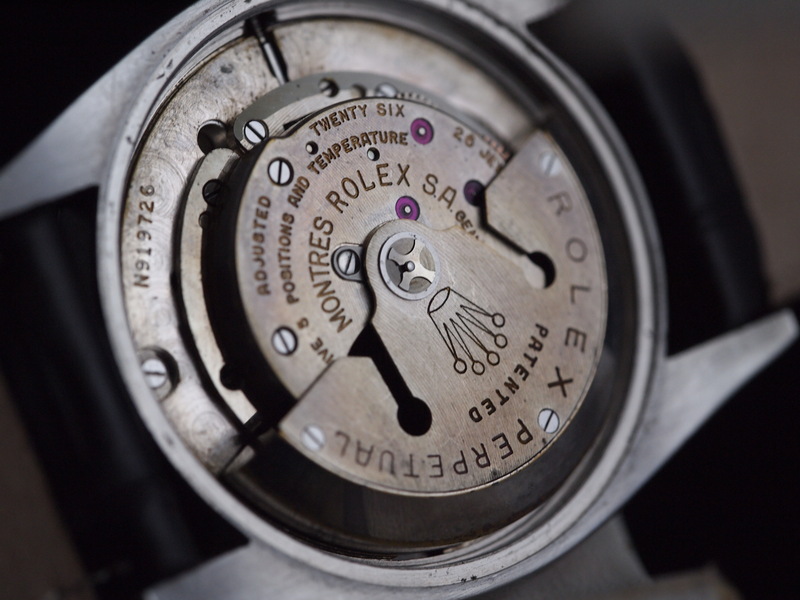 It has a dead-second complication, meaning the second hand “ticks” rather than flows. It was only produced for a very short period, and it is rare for its guts more than its dial (the dial however is nice too.) The caliber is a 1040. This is based off of a 1030 but has some additional height issues to accommodate the delicate and beautiful dead-second components. Watching it in motion it amazing. Fortunately for me (and more so for its owner) the dead-second components were totally fine and functional, so getting parts from a 1030 would be no problem. The only 1040-specific part I needed was the higher transfer wheel. After a thorough cleaning and inspection I found the things that were in dire need of replacement. Years of sitting in a box and running without oil undoubtedly cause wear. In the end I needed a new mainspring, transfer wheel, escape wheel, and automatic gear train. 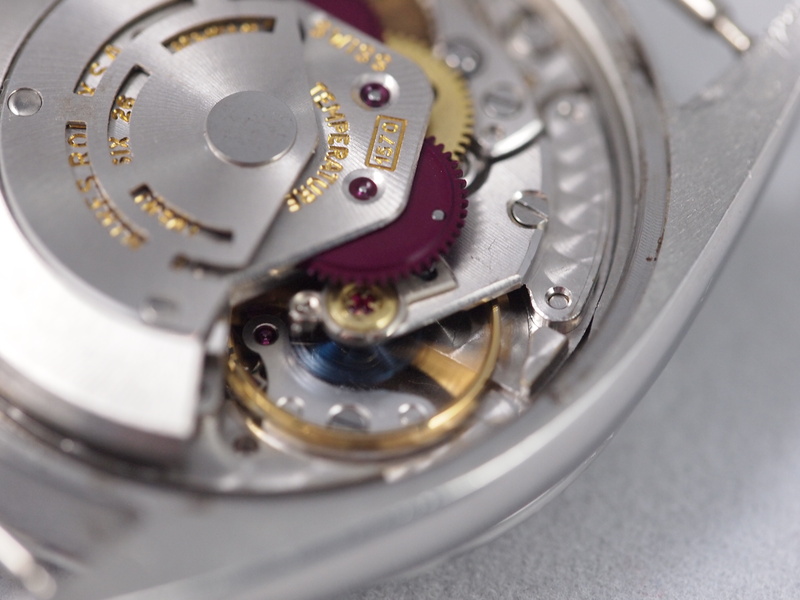 Even if an automatic watch doesn’t run, the rotor still does. Fortunately, all these parts were obtainable and the final repair bill was less than just about any modern Rolex service. Additionally I put a new crystal on it do the near perfect condition of the dial and hands could be fully showcased. Back together, the “tick” of the dead-second is incredible to see. It was a pleasure to work on. I continue to be amazed by the phenomenal variety of pieces people bring to me and that I get to work on, but this one was Tru-ly special. 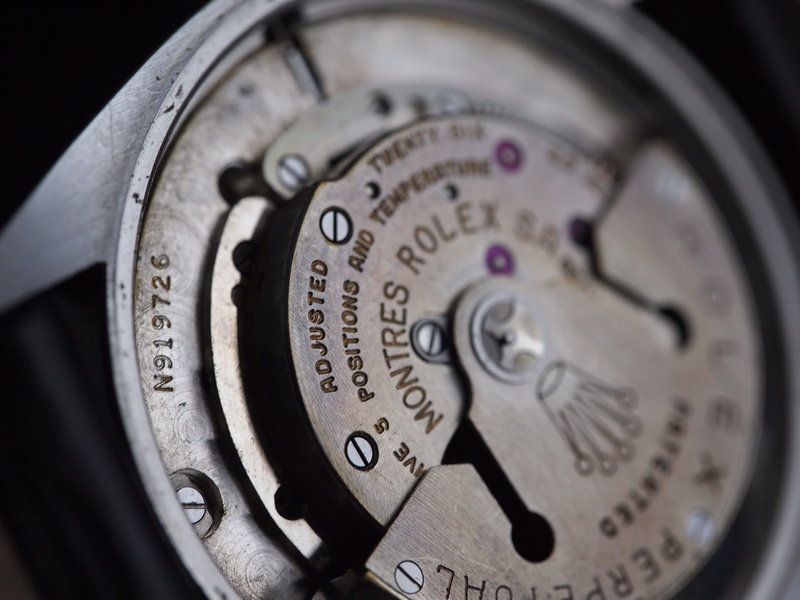 The actual title for this piece was going to be “My First Rolex (or How I Learned About Center Wheel Pinion Wear and Then About The Importance of Absolute Cleanliness)” but I opted to keep format and stick with the basic title. 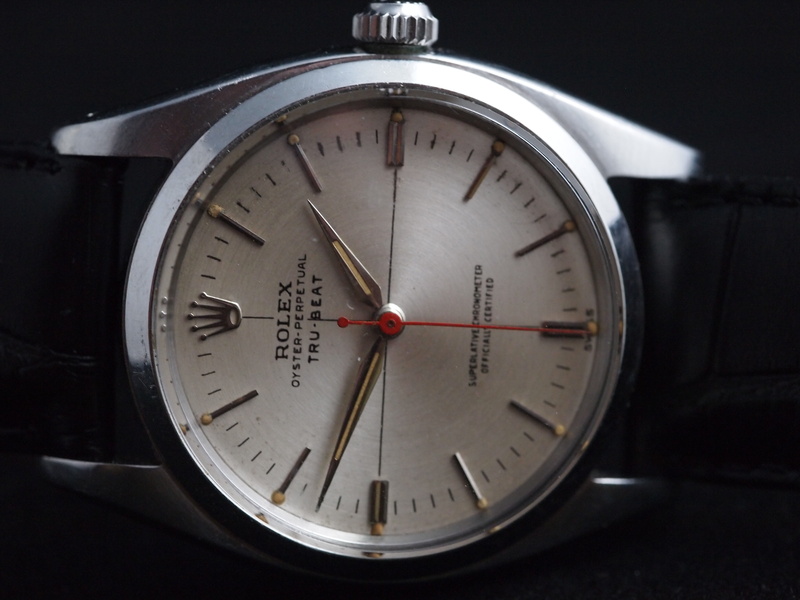 This 1500 was a great step for me as it is a huge confidence builder to have the service of a Rolex under one’s belt and be able to take one from +35 seconds/day to within chronometer specs. I look forward to servicing many more in the future. When I first got this watch, it appeared to be running fine, but it was fast by 35 seconds. This is not out of the ordinary for a watch that has not been serviced in a long time. With that knowledge I set about taking it apart. The main plate is finished incredibly well with perlage of differing diameters in different places. 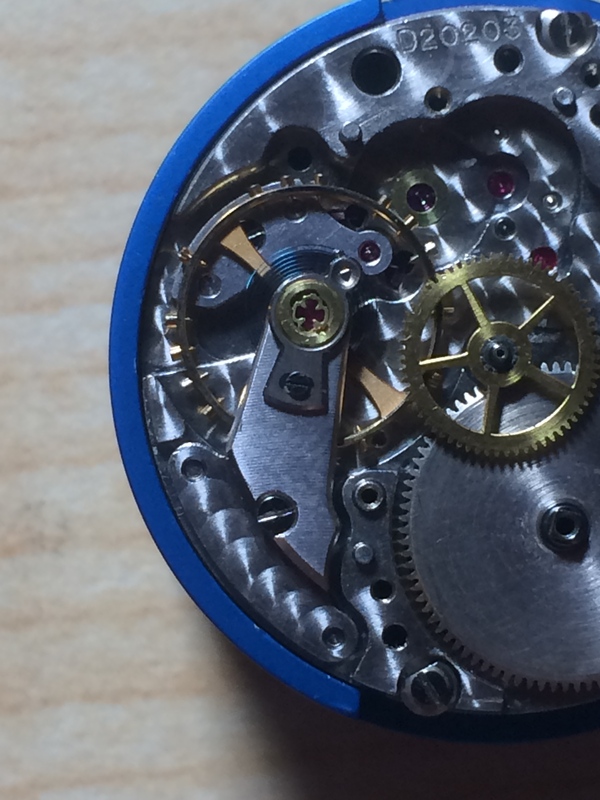 As this was an earlier version of the Caliber 1570 movement, this watch did not contain a hack function. 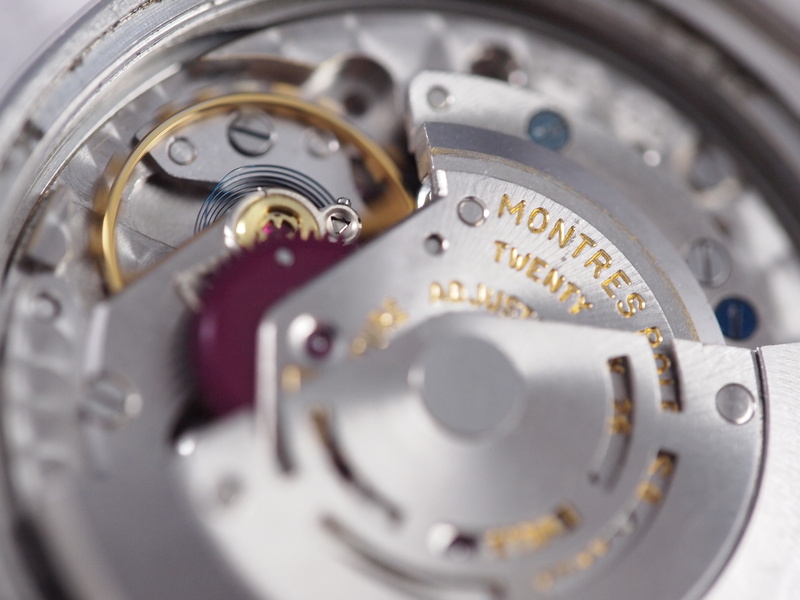 As a general rule, when servicing watches of this caliber, a new mainspring is a must. Once that was done I set about reassembly in the most delicate manner I could muster. A single mistake could have mean that I would be unable to finish this watch. 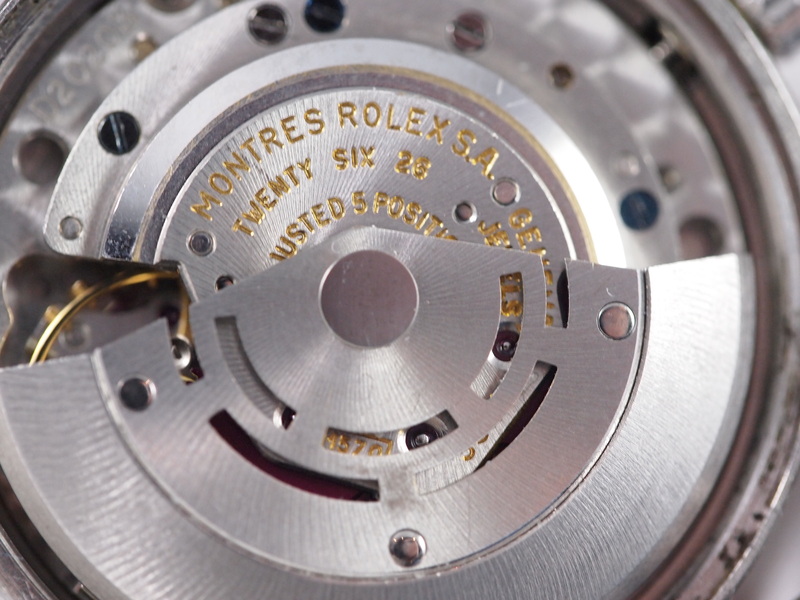 As Rolex is unreasonably restrictive on their parts, if I broke, dropped, or lost anything, I would either have to pay an exorbitant amount if the part was available or give up and sell the watch for parts. With that in mind I proceeded like porcupines mate (very carefully.) Unfortunately upon inspection of the gears I found something that made my heart sink. The center wheel had so much wear that it was wobbling in its place. 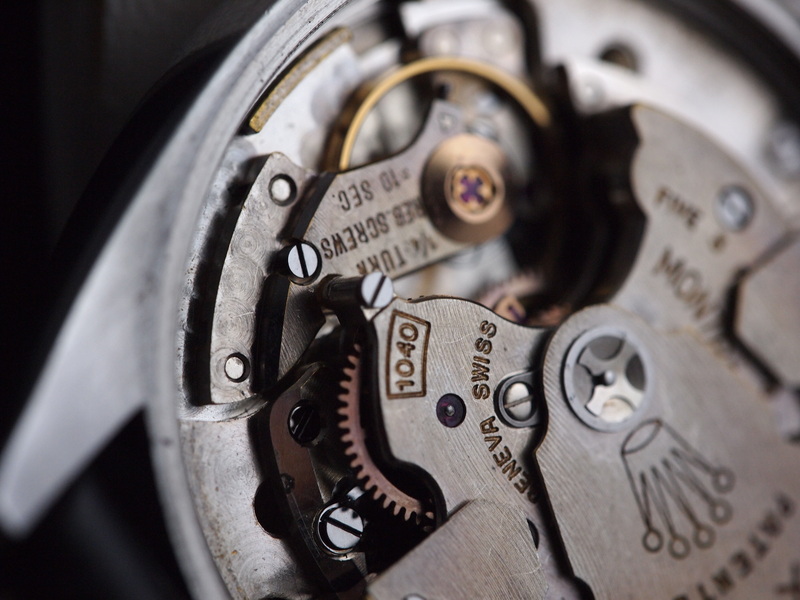 For some reason unknown to me the caliber 1570 does not contain a jewel for the center wheel on the main plate. This means that the wheel experiences metal-on-metal friction. Running time plus dry/no oil equals this kind of wear. The only fix is a new center wheel. 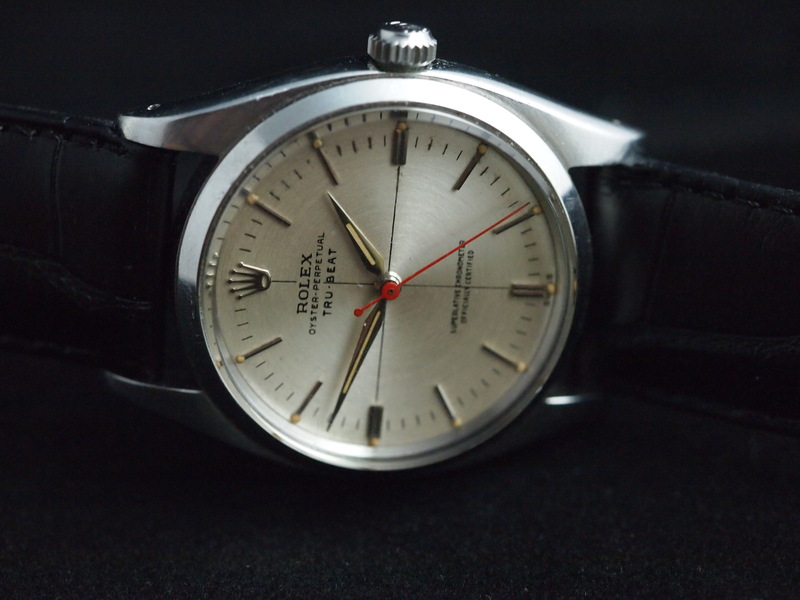 Fortunately there is a limited secondary market for genuine Rolex parts and I was able to get my hands on one. I think it was during this time (even though it was covered and protected) that the second problem arose. Once the new center wheel came in I cleaned it and got the watch together, I wound it up and installed the balance. If my heart sank before, this time it dropped through to the sub-basement. Everything was supposedly great and yet the movement would not run at all. I disassembled the watch and re-inspected everything. 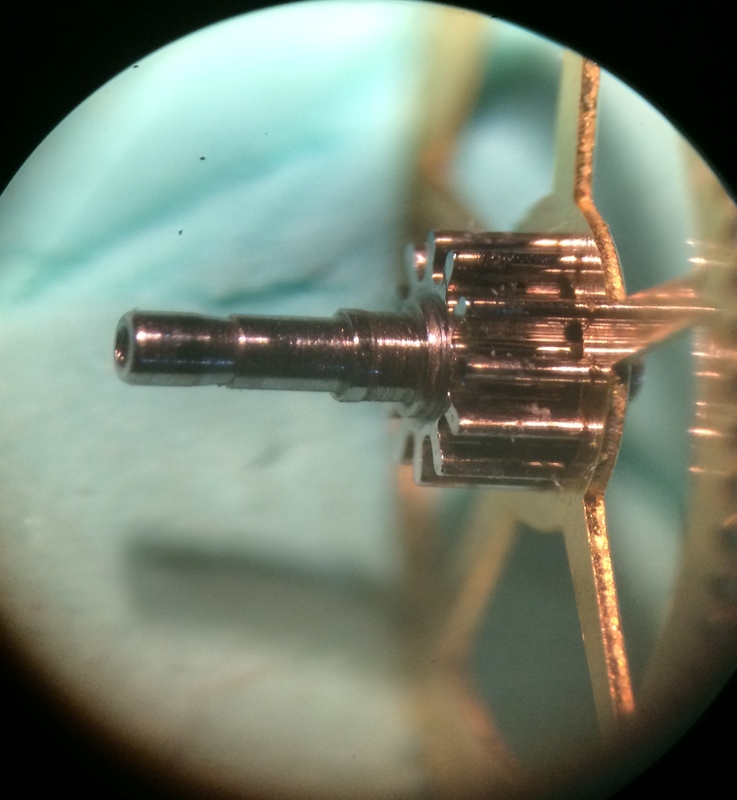 Then something caught my eye under the microscope: a hair had become lodged around one of the gear’s pinions. This teeny tiny little hair had the capacity to bring such a magnificent piece of engineering to its knees. 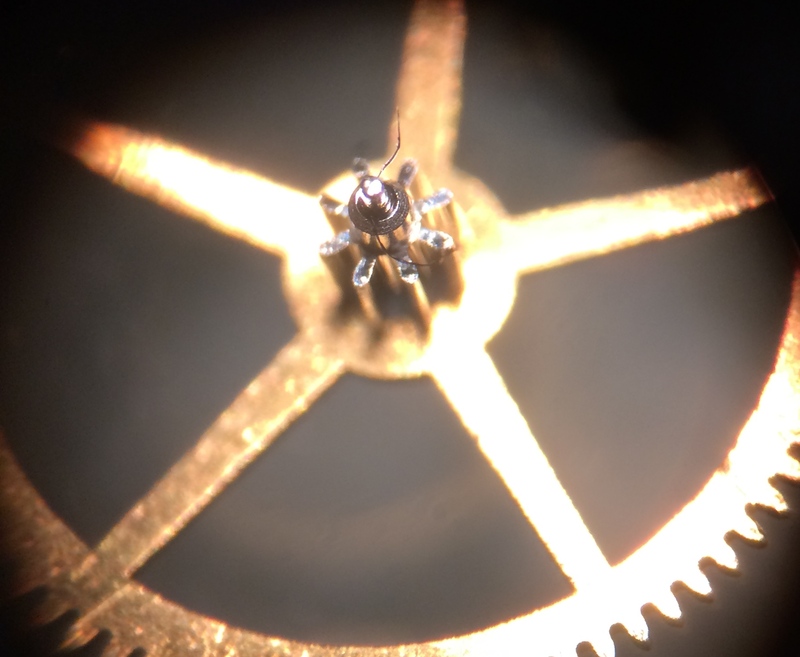 With the hair removed I reassembled the gear train and sure enough the problem was solved and the watch ran beautifully and accurately. 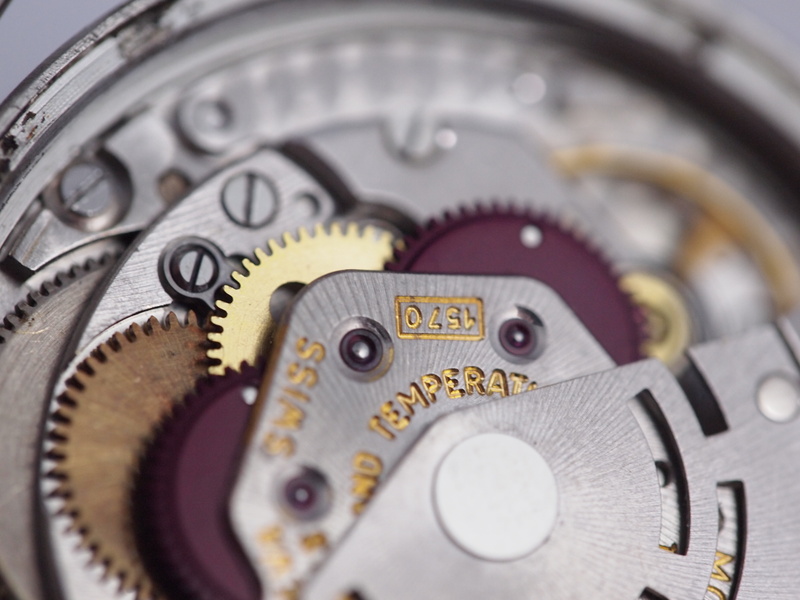 Once that whole fiasco was done, I put the dial and hands on and cased the movement. 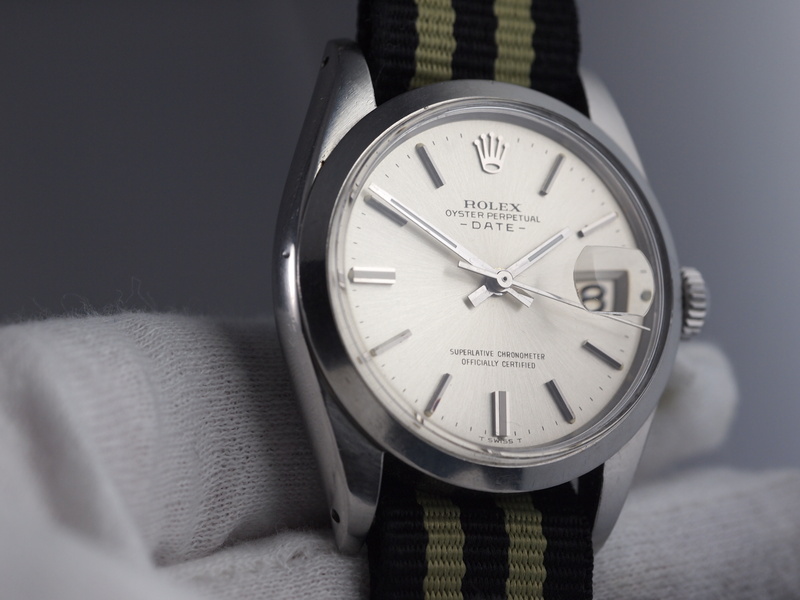 Back together it is a beautiful vintage Datejust that showcases the timeless elegance of the classic Rolex pieces. As far as the cleanliness aspect, I upped the filtration; installed sticky mats on the floor; clean the bench at least once daily with compressed air plus now apply an extra diligence to cleaning the pieces as I go about installation. Lesson well learned.